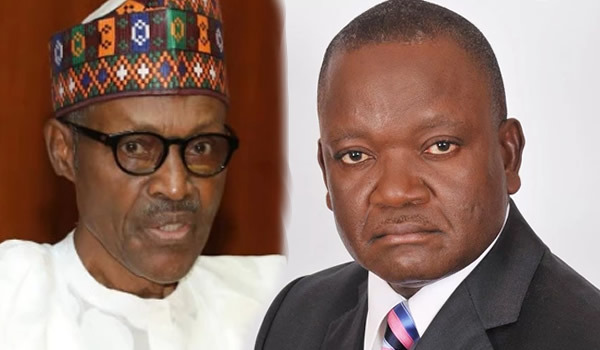 Benue State governor, Samuel Ortom on Thursday described President Muhammadu Buhari’s overall performance during the live programme on NTA on Wednesday night as shameful and a confirmation that he had lost control to the cabals in his government. The governor stated this at NKST Church, Buruku, while interacting with officials of the Christian Association of Nigeria (CAN) during his re-election campaign in the local government area. The governor who was reacting to the televised comments on President Muhammadu Buhari said the poor outing gave credence to what the president’s wife had been saying that he had lost control and a cabal had taken charge. On the planned cattle routes by the Federal government, Ortom insisted that there are no cattle routes in his state, stressing that even if there were such routes which were gazetted, he would have de-gazetted them as the current population of the state had made such routes untenable. The governor who stated that he battled and overcame financial, social vices as well as security challenges during his first term said his focus on these areas impacted negatively on his performance adding that if given a second mandate, the end of his administration would be better than his rough beginning. Governor Ortom stated that the All Progressives Congress, (APC)-controlled Federal government failed to forestall attacks on the state by Jihadists who openly declared their conquest and occupation agenda on the state and thereafter failed to give the people justice when they demanded it. He appealed to the people to seize the opportunity of the general elections this year to vote for all the candidates of the People’s Democratic Party (PDP) whom he said would protect their interests and guarantee their survival.